When did it get to be September? August was pretty much a blur to me. Between traveling to Maine, finishing some big freelance projects, and starting a new full time job, I'm not sure where the last few weeks have gone. But here I am, recharged from a nice, long weekend. I'm excited for September, the upcoming holiday season, and everything else in between. 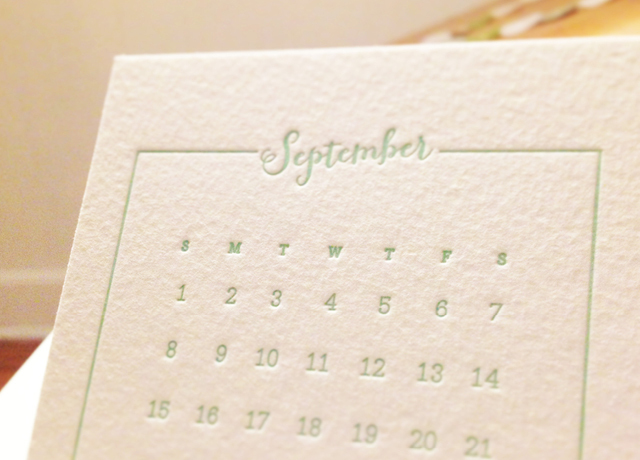 Letterpress calendar by SIMPLESONG Design. PS, Happy First Birthday to my adorable "nephew," Andrew!